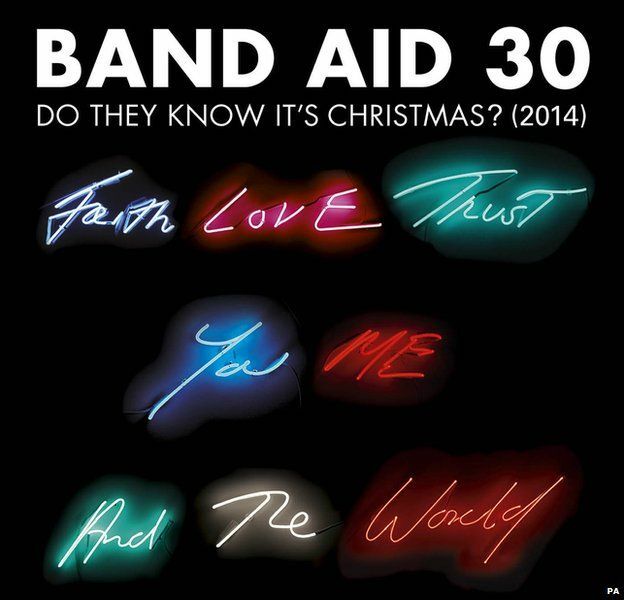 Bob Geldof says Fuse ODG didn't feature on the new Band Aid 30 track because he "felt awkward". He was supposed to join other artists to record Do They Know It's Christmas to raise money for Ebola-hit West Africa, but pulled out at the last minute. 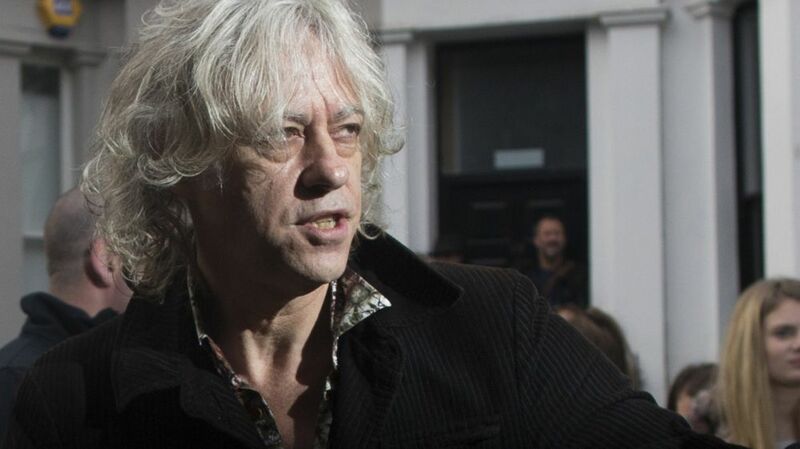 "I said change whatever words you like, it's your thing," Geldof told Newsbeat. 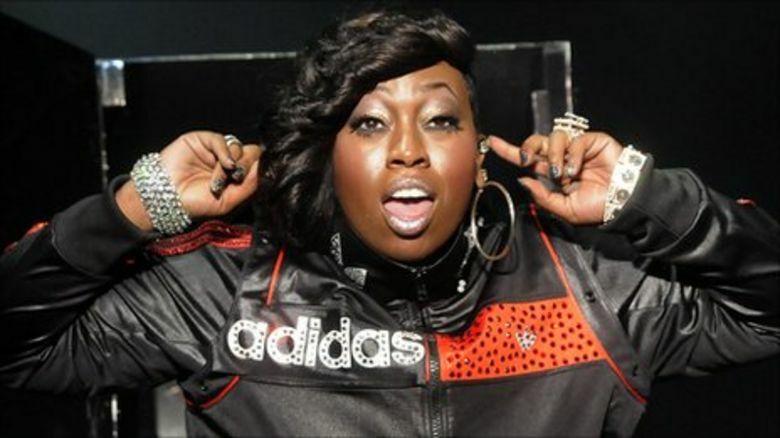 But the British-Ghanaian rapper didn't agree with the message of the song. Geldof said: "His thing was you had to be positive about Africa, but then you have Angelique Kidjo and Emeli Sande who were on the same attitude and I said there's the world's press, tell them about your point of view. "If there's a line you can't sing, change it and he said he just felt awkward." Fuse ODG is passionate about raising the profile about Africa and Africans, his current single T.I.N.A. 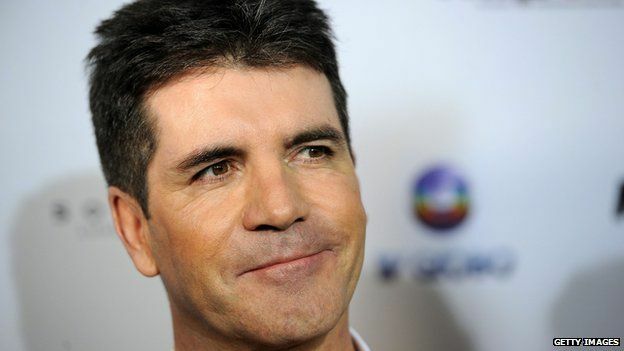 (This is New Africa), the name of the movement he's set up to help, features in the Official Chart Top 40. 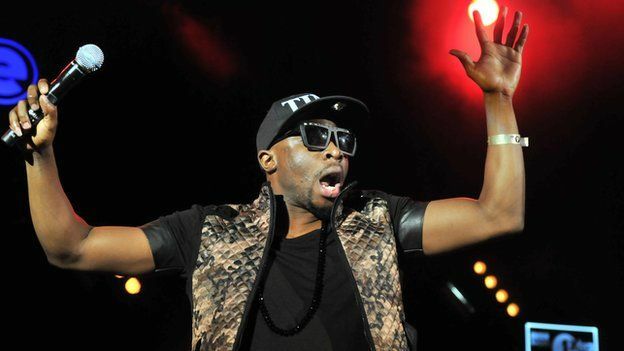 In a statement Fuse ODG said he initially agreed to be part of Band Aid 30 when he was approached by Geldof. 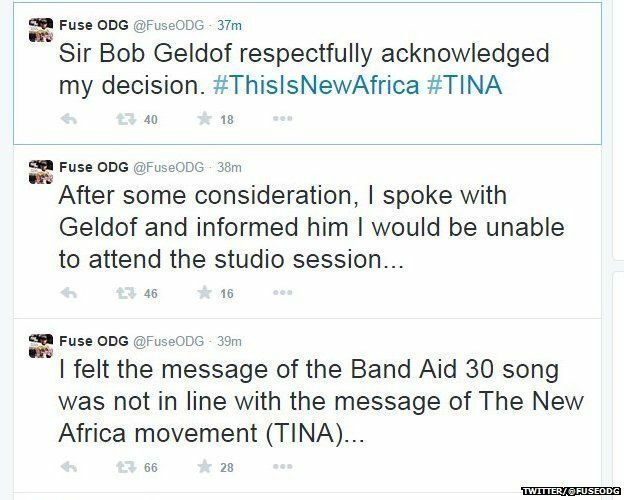 However, upon receiving the proposed lyrics, Fuse ODG felt the message of the Band Aid 30 song was not in line with the message of The New Africa movement. 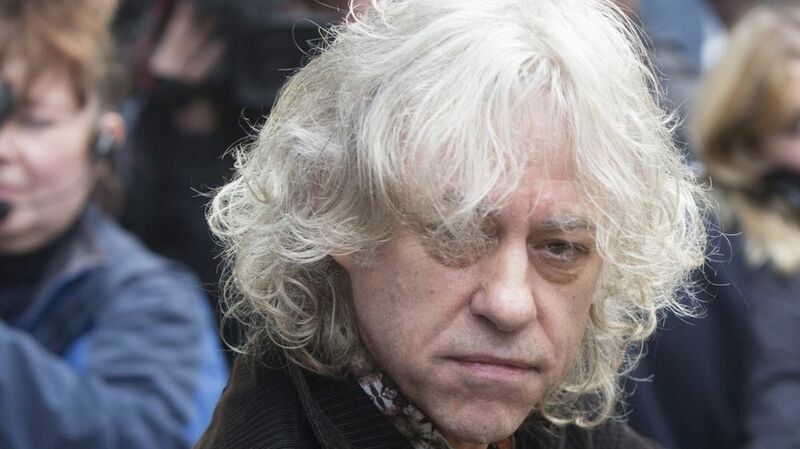 Bob Geldof understands where he's coming from: "He's quite right Fuse, this ridiculous image of this continent, seven of the top ten fastest growing economies in the planet are African and of those seven, five are countries where Band Aid operated." Geldof also confirmed Adele hadn't snubbed his call, "Adele won't pick up the phone to her manager. She's just out of it, which you respect. Nothing. She's not part of that anymore. That's absolutely her thing. "Some people just don't want to do it, some people say no. "Adele on the other hand isn't engaged in rock and roll, pop music, not picking up the phone to anyone. Brilliant." The single, to raise money for the Ebola crisis in West Africa, in which more than 5,000 people have died, was first aired on X Factor last night. 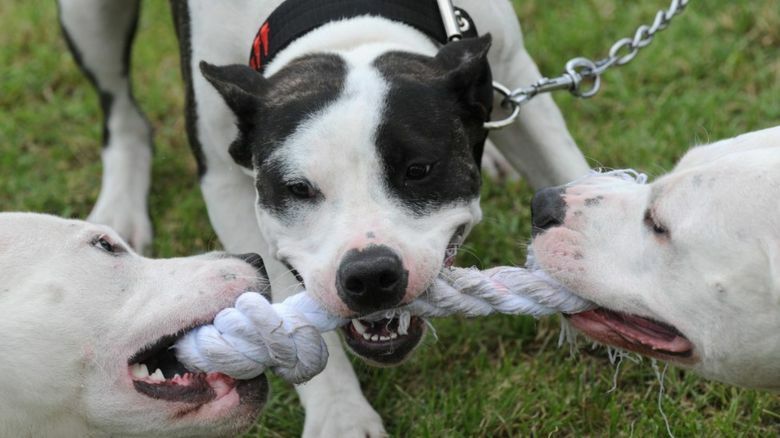 With half an hour to go until the programme it was almost pulled when ITV compliance stepped in. It was over a short piece of footage showing a seriously ill woman suffering from Ebola being carried out of her home by her arms and feet. In the end it did air with Bob Geldof appearing beforehand explaining why they were showing the footage first. Speaking about the film Bob said, " I don't know if it will end up on the video that's for sale, it was basically for the X Factor nation to show, you know, don't get enamoured by the performances of your favourite pop star, there's a logic and this could be this country." 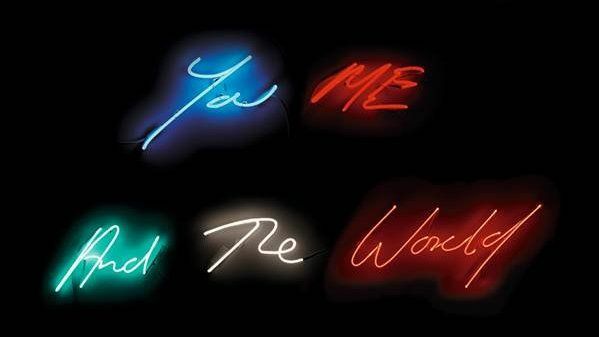 Four minutes after the single had aired on TV £1m had been donated. The 99p download was released this morning and appears to have crashed iTunes and it seems likely it will knock Children in Need off number one in the Official Charts on Sunday.